Baby Mercury - Free flight power model. Italian language plan. Quote: "Here is a plan for Baby Mercury by Adriano Castellani. 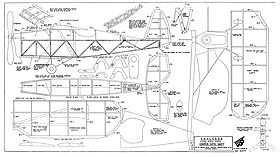 Plan published in: "Modelli Volanti, 1945, Italia". Wingspan is about 95cm."